Solid waste by definition is any type of waste materials with the exception of gases and liquid waste, produced by difference sources and are no longer regarded as valuable by their owner, and are therefore discarded. Solid waste includes organic and inorganic household wastes, local authority waste and general rubbish as well as both commercial and industrial wastes that have been thrown away. Solid waste disposal is one of major problems being faced by all countries across the world but the energy from solid waste cannot be neglected as a valuable energy source. Solid waste can be exploited to generate power and meet in some part the ever increasing demand for electrical energy allowing us to conserve the worlds finite supply of fossil fuels. The availability of so many different types of products in the shops and supermarkets has improved greatly our standard of living but has also resulted in significant increases in the quantities of solid waste generated due to its packaging. However, the increased emphasis on, and participation in, the recycling of household wastes has resulted in a significant decrease in the amount and types of solid wastes generated. 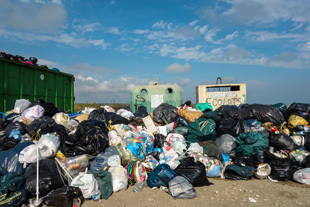 Solid waste management has always been a major issue for local authorities and governments because of the increasing concerns with landfill and environmental issues. One practical solution is to use this municipal solid waste, which can be classed as a renewable resource, for the generation of electrical power either directly or as part of a co-firing scheme. The practical use of the energy recovered from solid waste has been used for thousands of years. The burning, or incineration, of dry waste products such as wood, agricultural and forestry wastes and miscellaneous types of household wastes was first used to produce fire and warmth, and it is this simple idea that is the basis for today’s large scale energy generation from solid waste materials. The energy derived from the use of solid waste as a renewable energy resource does not have the same negative environment impact associated with the burning of non-renewable energy sources such as fossil fuel coal. However, despite the fact that the incineration of unwanted solid waste can actually decrease its volume after burning to a pile of ash and dust, the full potential of using dry solid wastes for the production of energy is still not being fully realised because of fears of environmental pollution. The co-firing of a modern coal energy powered electrical generating plant with municipal solid waste or dry agricultural wastes reduces the amount of fossil fuel coal needed to power the plant, thus reducing the cost of the electrical energy as well as the amount of carbon dioxide (CO2) emissions produced from burning the coal resulting in energy savings and a decrease in environmental pollution. Modern waste-to-energy (WTE) incineration plants have made significant advances in addressing some of the technical and practical problems and difficulties of material handling, combustion and gas control. The early days of burning solid waste materials in large furnaces with little or no concerns or regulations for air pollution and waste ash disposal are long gone. Today with increasingly stringent ash and air pollution control regulations, more complex incineration plants are now being built. But besides incineration, gaseous fuels, called biogas, can also be obtained by using anaerobic digestion processes in conjunction with landfill gas recovery. The capturing of methane based biogas as a renewable energy resource has many uses and could be argued that there is very little environmental differences between the collection of biogas methane from man-made landfill sources and those generated naturally from geological or fossil fuel sources, as both have an equal impact upon the environment. Waste reduction and waste recycling are the fundamental forces driving any future solid waste management strategy in order to understand the composition of waste by its individual components. Non-hazardous waste materials generated during the construction of buildings and infrastructure, including renewable energy projects, such as paper, carton, wood packing and crating materials can all be shredded or recycled to divert this waste wood from landfill. The most important benefit of solid waste as a renewable energy resource is in the decrease of environmental pollution and one of the more practical ways of using organic solid waste is in composting. The shredding and pulping of agricultural and forestry wastes produces materials that can be productively used to help improve the properties of poor quality soils. Most solid garden wastes such as leaves, twigs, sticks and grass clippings, etc. can all be easily composted in simple composting bins without pest or odour problems. Reducing organic solid wastes at home into compost has many benefits producing a finished product that can be used as a soil amendment to improve dry sandy soil or heavy clay soils allowing roots to spread and the plants and soil life to breathe or as a top dressing and mulch. Domestic waste resources that can be used for energy production are diverse. The world’s energy markets today rely heavily on finite sources of fossil fuels coal, petroleum crude oil, and natural gas as their primary sources of energy. Every year, millions and millions of tons of solid waste are disposed of by landfill, while at the same time, millions of tons of coal, oil and natural gas is incinerated to create electrical power. The use of solid waste for renewable energy and fuels represents a significant alternative energy supply to reduce our dependency on traditional fossil fuels. The benefits arising from the installation and operation of renewable energy systems which use solid waste as their main fuel source can save energy and help decrease the amount of environmental pollution as a result of reduced landfill and harmful gas emissions. To learn more about solid waste and recycling, or if you just want to explore the advantages and disadvantages of how solid waste management systems, then Click Here to get your copy of one of the top books on solid waste management direct from Amazon today and learn why incinerators are no longer an option and landfills are filled to capacity. I’m the District Environmental Officer in Tabora, Tanzania. I real get the message. We need this technology so as to control solid waste in my District. Come that you may share with us on waste – energy conversion. We are ready for adaptation…… Welcome.